At the starting point of the Paraná delta, in the outskirts of the city, is the town of Tigre, set on an island lined by small rivers and streams. This rugged location surrounded by nature offers a variety of attractions including canoeing, kayak and other excursions by boat, trekking, ecotourism, motorboat and commuter boats to take you to different places on the riverside, restaurants, spas, tea-houses, picnic sites, a naval museum, an art museum, a mate museum, a casino, a crafts fair and an amusement park. - At Retiro station you have to take Mitre line train going to Tigre. Trip duration: 50 minutes. 1. Retiro to Tren de la Costa: At Retiro station you have to take the Mitre line train heading to Mitre station. Once you have arrived at Mitre station you have to cross the bridge over Maipu 2600 Ave, which takes you to Maipu station of Tren de la Costa. 2. Maipú station of “Tren de la Costa” to Tigre: At Maipu station of Tren de la Costa you have to take the train going to the Delta. It is a 30-minute long trip in a modern train with a beautiful view of Rio de la Plata and you can get on and off as you please. Getting to Tigre by bus- Take Line 60 bus which starts its route at Constitucion. Trip duration: 90 minutes. For a great lunch on your way to Tigre stop by Tipula, a Spanish inspired gourmet restaurant belonging to Fierro Hotel’s chef, Hernan Gipponi. Vicente Lopez 76, Martinez. 4793-7185. 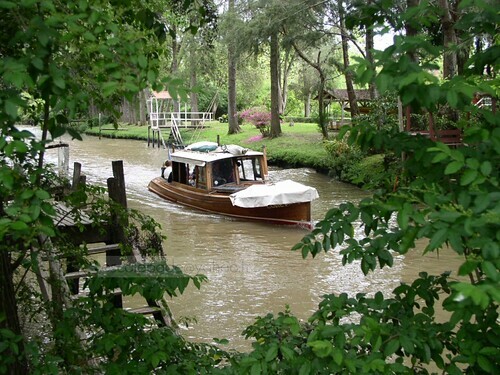 This entry was posted in Off the Beaten Path, Where to Go, What to Do and tagged argentina, Boat rides, buenos aires,, day trip, delta, Gourmet, how to get there, Off the beaten path, river, spa, tigre, Travel, what to do by Fierro Hotel Staff. Bookmark the permalink.